William Hill Sportsbook is an outfit that has been around for a very long time. In the entire time we have been online (5 years) we have received hundreds of complaints about dozens of sportsbooks. William Hill has not had one complaint here at SBA. William Hill is a European bookmaker that caters to non-USA. April 25, 2012 WillHill (Rating A) Limits New Players from Australia. Gaming legislation is an ever evolving and changing process. In Australia right now changes are being made. As a result William Hill Sportsbook is not accepting new players from Australia, but will still maintain the existing clients from that region. More About William Hill Sportsbook. 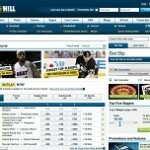 April 13, 2012 Longtime Online Gaming Company William Hill Upgraded to “A Rating”. This is a publicly traded company you can trust with your business. Visit Will Hill Now. January 15, 2009 William Hill Enters Guide at B+. WillHill is a British Bookie that has been around for quite some time. They offer action on Casino games and Horse races as well. WillHill does not accept U.S. clients. Founded in 1934, William Hill is one of the best-known names in the gambling industry, providing gaming and betting services across three channels: online, on the high street and on the phone. We have been listed on the London Stock Exchange (WMH.L) since 2002 and employ over 15,000 people in the UK, Ireland, Israel and Bulgaria.